Realm of Horror - News and Blog: Official UK trailer for "68 KILL" released. Blending quickfire thriller with bracingly visceral belly laughs, 68 KILL introduces Chip (Matthew Gray Gubler, Criminal Minds) a simple guy scraping by as best he can by flushing septic systems for a living. Thankfully, Chip’s girlfriend Liza (AnnaLynne McCord, 90210) has her head screwed on. When she suggests that they relieve a sleazy benefactor of a stack of cash, Chip begins to see a side of her he never knew existed… or never wanted to admit. Outsmarted at every turn by headstrong women, Chip finds himself with a gun in his hand and less than 24 hours to figure his way out of a colossal mess. 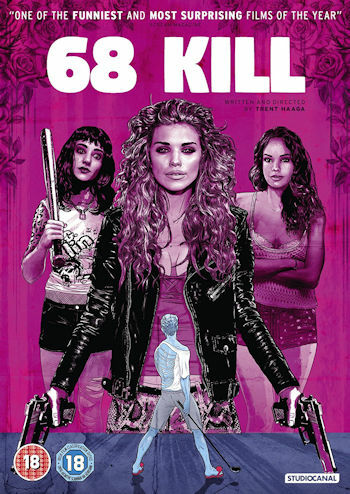 68 KILL is a dark, violent, hilarious and psychedelic trip into Americana that has already caused a stir at film festivals and is sure to leave a satisfyingly sour taste in the mouth of any thrill-seeking film fan.